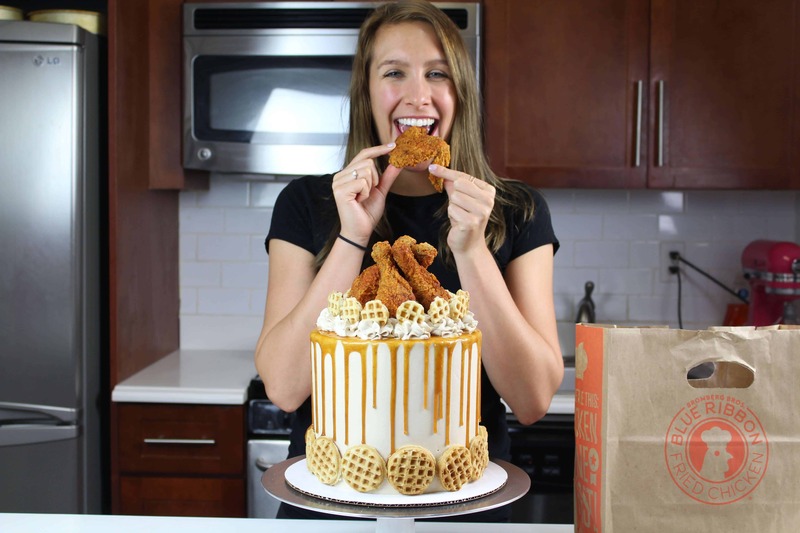 I’ve made chicken and waffle cupcakes before, but had yet to man up and make a chicken and waffles cake! After trying Blue Ribbon Fried Chicken‘s amazing chicken, I knew what had to be done. 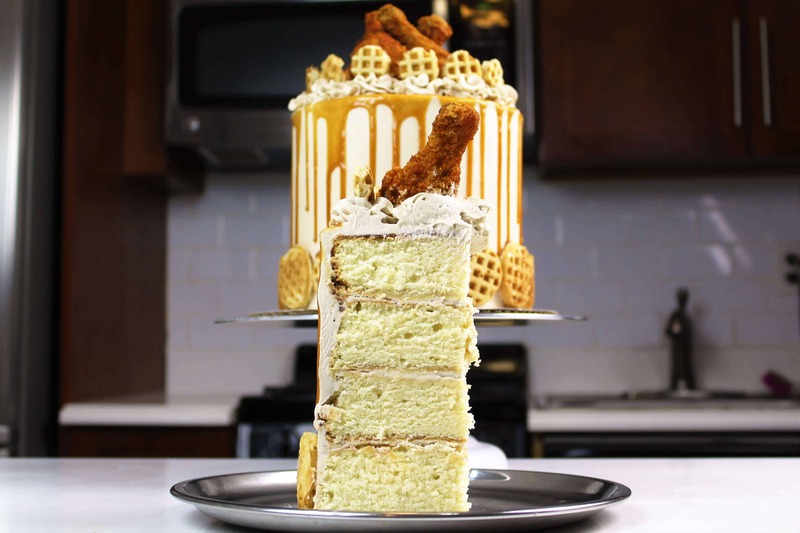 I ended up making fluffy buttermilk cake layers, frosted them in a maple, bourbon buttercream, added a spicy caramel drizzle, and topped it all with some drumsticks from BRFC. The recipe and instructions can be found below, and a full tutorial can be found here. In a separate bowl, combine all wet ingredients (vanilla extract, eggs, buttermilk, and vegetable oil), and whisk to combine. While the cakes bake and cool, prepare the vanilla buttercream frosting (click here for tutorial). Whip the butter until it is light and creamy, then slowly add the powdered sugar. Alternate installments of powdered sugar with bourbon and heavy cream, and continue mixing until the frosting has reached desired consistency. Add salt, maple extract, and vanilla, and continue mixing on medium-low until fully incorporated. Next, prepare the spicy caramel (click here for a tutorial)! Turn stove onto medium heat, and place a pot over element. Pour in sugar. Using a heat proof stirring utensil (I use an old-fashioned wooden spoon), stir until sugar begins to melt into a clear liquid. Continue to stir, until clumps of sugar begin to form. Slowly the color of the sugar clump will deepen from white to amber. Keep stirring until all the clump of sugar have dissolved, and then turn off the heat. Mix in butter slowly, then stir in cream, cayenne, and salt. Place in fridge to cool for 20 minutes, then pour into desired container. I put mine in a squirt bottle (for drizzling)! For the cake assembly, I also made miniature waffles to decorate the cake. I used pre-made waffle mix, as this cake already has enough components from scratch!! 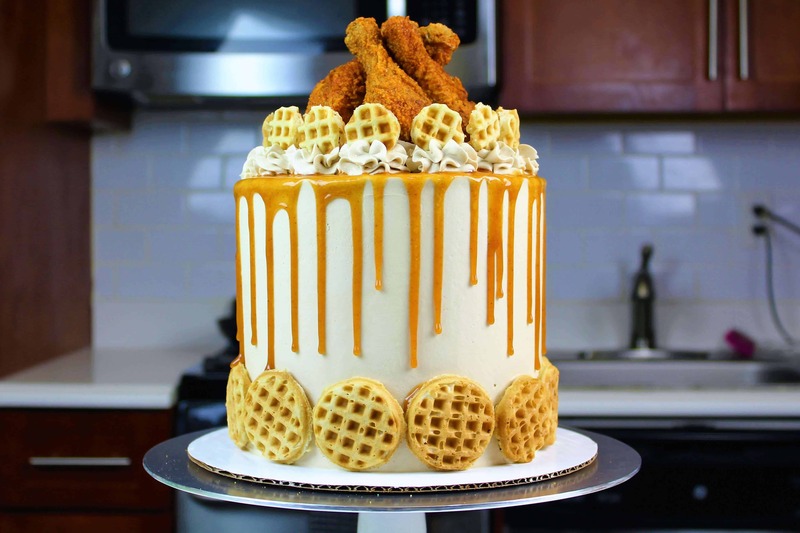 I stacked and frosted the cake layers, then decorated it with miniature waffles, spicy caramel drizzles, and of course, FRIED CHICKEN!!! The end result? A deliciously sweet and savory cake.